Call it what you want, Flammkuchen, German Pizza, Tarte Flambée or French Pizza. The only important thing is, it’s the best pizza in the world. Where I come from we call this “Flammkuchen” which means something like ‘flame cake’ or ‘cake baked in the flames’. It is originally from Alsace, a region of now Eastern France. During and after the Roman Empire the region belonged to what today is Germany which is why this delicious pizza has so many names. 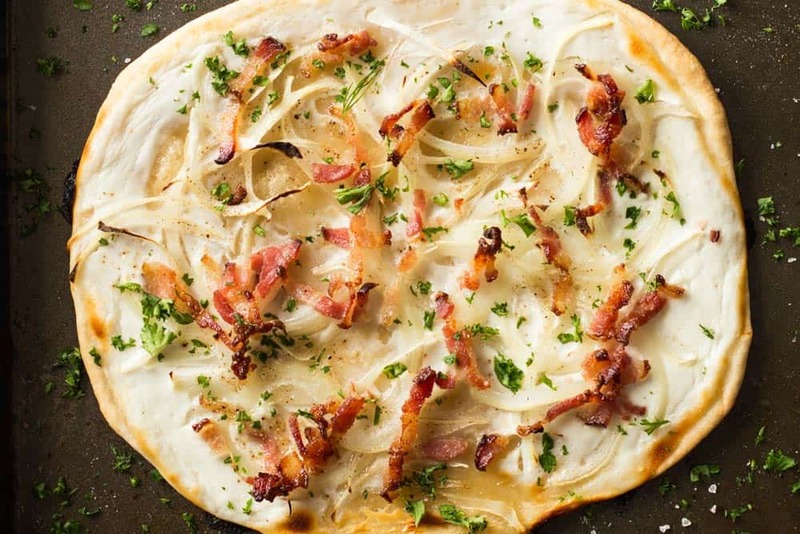 The original Flammkuchen is the one with just French cream cheese, thinly sliced onion and bacon. Very simple and simply delicious! I figured it would be fun though to show you a little twist on the original recipe. So here is a great recipe two ways. Original and fancy. Simple and elegant. Delicious and scrumptious. In case you were wondering this. The German ‘a’ is pronounced like the ‘a’ in “alpha”. The double ‘mm’ indicates that the ‘a’ ahead of it is short, not long. The ‘u’ is pronounced like the American English ‘ew’ in “new”. The ‘ch’ is pronounced like the Scottish English ‘ch’ in “loch”. The ‘e’ is pronounces like the ‘e’ in “elegant”. Now to the way more important part, who cares how that thing is pronounced anyway? Just call it “German deliciousness” if you want. The most amazing part about this German pizza (or French, always giving credit to our lovely neighbors) is that there is no yeast in the “dough” and thus it’s ready in like 5-10 minutes . The whole pizza start to finish takes less than 30 minutes to make if you work quickly. The crust requires only 4 ingredients: flour, salt, water and oil. That’s it. Make sure you use the right proportions to achieve an elastic dough and you are good to go. If for some reason my measurements don’t work for you (flours are different all over the world), add a little more water or flour as needed, in 1/2 Tablespoon increments. The goal is to end up with a dough that doesn’t stick but is fairly elastic so it’s easy to roll out. This pizza is different than the typical Italian pizza. No need for tomato sauce as a base and no need for cheese on top. A soft cheese called “fromage blanc” or if you can’t find that “crème fraîche” is the base for this pizza. It’s a white pizza. My favorite! This cheese is like something in between greek yogurt and cream cheese. You can’t use either on this pizza. The greek yogurt contains too much water and the cream cheese to little and adding water doesn’t work either. “Quark” might work, too. I haven’t tried though. I’ve also never heard of anybody putting quark on their Flammkuchen. If you ever try, let me know in the comments if you liked it. One of the most important steps is to cut the onion (and bacon if using) very very VERY (did I say very enough times?) thinly. The pizza will go in the oven for only 15-17 minutes. If the onion slices are too thick they don’t become soft and sweet but rather stay kind of raw and yucky. The same applies to bacon. 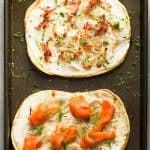 If you already have spliced onion in your fridge and don’t want to waste it, give it a quick toss in a slightly oiled pan before adding to the pizza. This is an extra dish and an extra step though. Boo. This pizza is best served with a simple green salad soaked in Maple Mustard Balsamic Dressing. 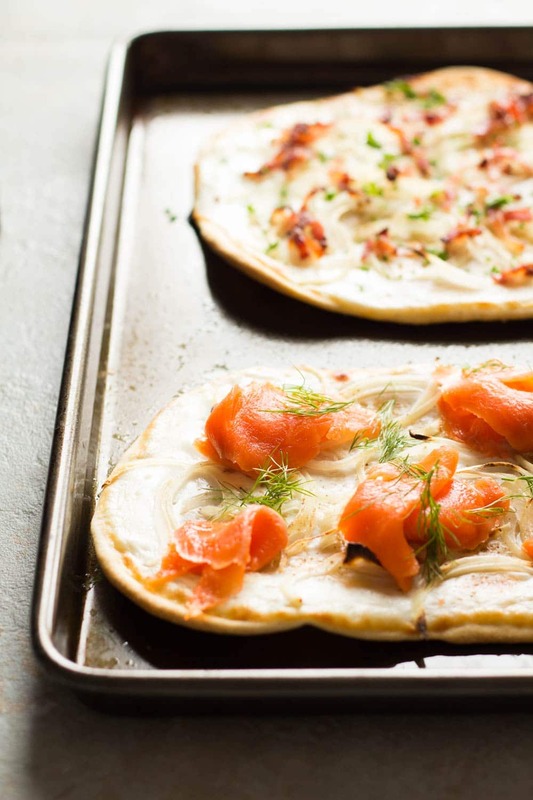 Call it what you want, Flammkuchen, German Pizza, Tarte Flambée or French Pizza. The only important thing is, it's the best pizza in the world. Preheat oven to 500 F (260 C). Mix flour, salt, water and oil in a bowl until starting to clump, then use your hand to knead into dough. Divide dough in two, roll out thinly and place on a thick baking sheet. Cut onion and bacon into VERY thin slices. 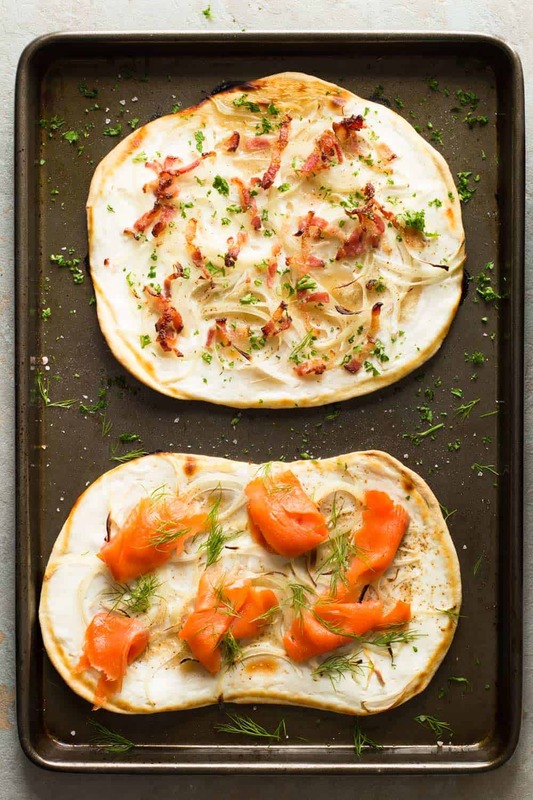 Spread fromage blanc or creme fraiche on each of the two pizza bases, sprinkle onion over both and bacon over one. Salt and pepper generously. Bake for 15-17 minutes keeping a close eye on them to avoid burning. 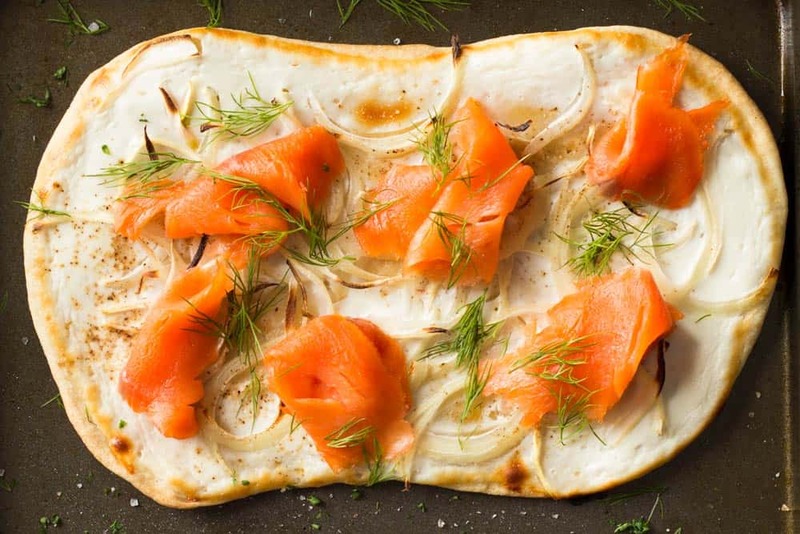 Remove from oven and add smoked salmon to the pizza without bacon, sprinkle dill leaves over the salmon pizza and freshly chopped parsley over the bacon pizza. Enjoy immediately. I’ve used quark on flammkuchen. It is a fine substitute for creme fraiche. Anyway, where I lived, you also had to sprinkle some cayenne on top of the sliced onions and speck (bacon). There are many variations on the original and it is all good. I’m happy to hear quark worked for you :D And Cayenne on the onions and speck sound heavenly! I make the Flammkuchen very offen and I only sour cream, speck and onion and that ist how the french make it. I love that one so much. Yummy! I have just baked the salmon and dill flammkuchen. I loved the flavour but the Base was very tough and hard. I used the regular household flour but the maximum heat from my oven is 230c. I took it out after 14 mins as the edges were beginning to burn. How can I get a better base. 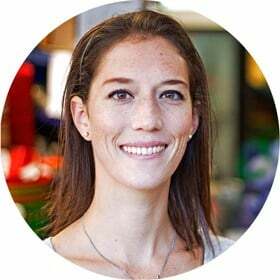 Hi Kathleen, I’ve recently learned that most European ovens work completely different to American ovens. It’s hard to make exact conversions. The American ovens heat mostly from the bottom and the top is only turned on when switching to “broiler”. One thing you could try is use a cast iron skillet and put in the oven while preheating so it gets really hot. 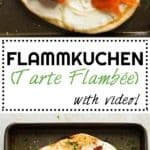 make your Flammkuchen round shaped and then carefully add to the cast iron skillet so it bakes like pizza on a pizza stone. Leave it there for only about 10 minutes or until the edges start slightly browning. Thank you Lorena. I will try your suggestion. Please do not use Quark on Flammkuchen! Im german and I prepare those quite often. You will love the crème fraiche, Quark has a totally different tast. Top it with green onions and “Speck” (bacon) and thats all you ever want to add to it. OR you can try with slices of hokaido pumpkin, thats delicious too.